by Rob - May 8th, 2012. 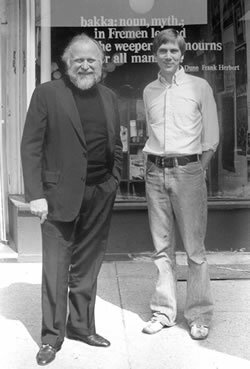 Pictured: Dune author Frank Herbert and Bakka owner John Rose, outside of Bakka’s old 282 Queen Street West location in Toronto, where Robert J. Sawyer worked in 1982; Bakka was named for “the weeper who mourns for all mankind” from Dune. Photo by Tom Robe from 1981. Just about exactly thirty years ago, I started the best summer job I ever had. I worked at Bakka, the science-fiction bookstore in Toronto, for four months in the summer of 1982. What an education in bookselling! Many writers have long resumes, listing all the odd jobs they did to support their craft. Not me; I’ve only ever had two jobs since graduating in 1982. Ryerson hired me to return for the following academic year to help teach television studio production techniques to second- and third-year students. I graduated in April 1982, and the job at Ryerson didn’t begin until September — meaning I had four months off with nothing to do. I’d moved away from home after my second year at Ryerson, and had bills to pay. Enter John Rose, the elfin proprietor of Bakka, Toronto’s science-fiction specialty bookstore. I’d been a regular customer of the store for eight years by this point, and John offered me a summer job. The pay was just $4.25 an hour; I probably could have found something somewhat more lucrative, but the chance to work in a science-fiction store was too appealing to pass up. I worked the cash desk, shelved books, and counted inventory — but there was one part of the job I managed to avoid. Books go into bookstores on a returnable basis, meaning if they don’t sell, the retailer can return them to the publisher and owe nothing. But for paperback books — the format back then that most science fiction was published in — only the covers of the books are returned. They’re ripped from the body of the book, and the store destroys what’s left. The other clerks, who were long-term employees, all had to do this, but I managed not to have to do it; I said — only half-kidding — that I thought it would scar me for life. I really didn’t end up making any money at Bakka. As an employee, I was entitled to a 40% discount on everything in the store, and I spent almost my entire earnings buying books. Still, in June of that year, John Rose did something remarkable. He took me to the annual convention of the Canadian Booksellers Association. It was, in many ways, a crazy thing to do — John had to (a) pay me my wages for the day I attended, and (b) pay a fee to get me in. But John knew I wanted to be a writer, and he thought I should really see how the retailing industry works. The CBA convention — now called BookExpo Canada — is where publishers come to show retailers their upcoming books, and where big-name authors sign copies of their new books for retailers (the comparable American event is, not surprisingly, called BookExpo America). That summer was an incredibly eye-opening experience for me. Many of my writing colleagues are astonished about how savvy I am about the business of publishing; well, the seeds of that came from that summer working in a bookstore, and that day at the CBA. I went on to a successful writing career after working at Bakka, but I wasn’t the only one. In the two decades that have followed, several other Bakka employees — all hired long after I’d left — went on to writing careers, including Tanya Huff, Michelle West, Nalo Hopkinson, and Cory Doctorow. In honor of the store’s thirtieth anniversary in 2002, John Rose asked each of us to write an original SF story to be published in a limited-edition anthology. He couldn’t afford to pay us for the stories, but we all agreed — we all owed John far too much to worry about doing some work for free. A great way to begin your Sci Fi Authoring career. I didn’t have that opportunity or I might have as well been a Writer and not a doctor! However, I am enthralled at this amazing opportunity that you had. And I’m also glad to know a factor which shaped the life of easily my best Science Fiction author. This article is truly an exposition to me. And I’m grateful to you, Robert for having the time to share it with us and allowing you know to know you better! You really started from humble beginnings. And yes, it’s a Gr8 thing!